A strange noise has begun echoing across the world. Twelve people just fell form the sky claiming they’re from the year 2074 and they’re not sure how they’ve been sent back through time. A group of young terrestrial researchers headed by UFOlogist Lorraine Gardner (Angela Cole) are trying to track down the origin of the sounds and get the answers the government isn’t giving. They’re going to need a little something extra if they want to survive what they’re about to uncover. 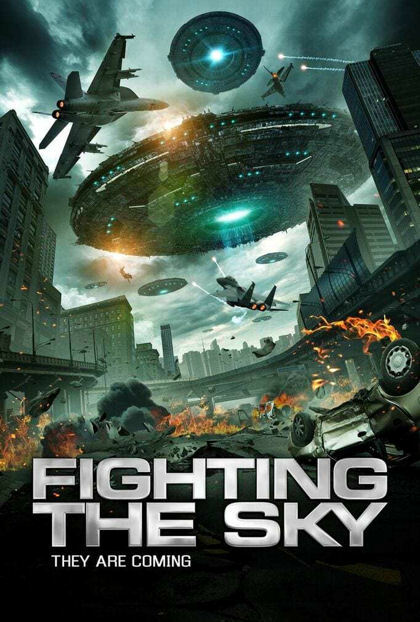 With a bright filming style similar to the latest outside Hollywood Christian movement movie to hit theaters and a continuous, ominous score that makes even the most docile of events seem cataclysmic, Conrad Faraj’s Fighting the Sky is a surprising yet disorientating investigation in to mysterious events happening on Earth the news channels are calling of alien origins. A slow pace with lots of dialogue makes the first hour drag before we get to the action and an explanation of what’s happening. The final half hour is amazing though. This low budget to no budget feature provides some of the best use of CGI in limited quantities, creating unidentified flying objects that look better than most blockbusters. Even better they actually beam things up! Creature suits over CGI monstrosities are another win for this fight in the sky with a twist ending that’s Robert Zemeckis approved. The bright filmmaking, score, upbeat tone, dialogue and casting of youths in roles that better fit adults are completely off-putting. I rarely say this but CGI, models or whatever they used are outstanding. The creature suits are a great use of fun practical effects and the twist ending I never saw coming.